By Jon Greenberg on Wednesday, August 6th, 2014 at 3:29 p.m. 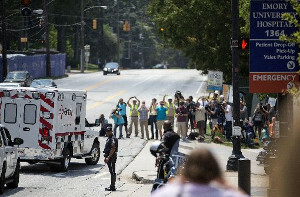 The arrival of two Americans infected with the Ebola virus at an Atlanta hospital has ginned up the fear mill and the conspiracy website Infowars.com has fused fear of infection with fear of Big Brother. When the first American was admitted to Emory University Hospital’s special infectious disease treatment center, Infowars.com wrote, "United States officials brought an affected (sic) patient into the country only days after President (Barack) Obama signed an executive order mandating the detention of Americans who show signs of ‘respiratory illness’." At another point, the article says Obama’s latest executive order "mandates the apprehension and detention of Americans who merely show signs of 'respiratory illness.' "
The article correctly reports that President Barack Obama signed an executive order on July 31, but beyond that, the accuracy quotient falls rapidly. As for the Ebola patients, government officials did not bring them back to America, as Infowars said. While the State Department facilitated the paperwork for the medical evacuations, these people arrived in a private chartered jet paid for by the religious charities they worked for, Serving in Mission and Samaritan’s Purse. At a news conference, Bruce Johnson, the president of Serving in Mission USA, said his group has spent about $1 million on the two patients since their illness was discovered. Second, and more important for this fact-check, is what the executive order says. It's much more targeted than the article describes, it isn’t aimed at Ebola, and while it allows health officials to quarantine someone with a highly contagious disease, it does not mandate it. On July 31, Obama modified a 2003 executive order from President George W. Bush. The original listed the communicable diseases for which the Department of Health and Human Services was authorized to issue an isolation or quarantine order. Bush specifically mentioned Severe Acute Respiratory Syndrome (SARS), a disease associated with "fever and signs and symptoms of pneumonia or other respiratory illness." "Severe acute respiratory syndromes, which are diseases that are associated with fever and signs and symptoms of pneumonia or other respiratory illness, are capable of being transmitted from person to person, and that either are causing, or have the potential to cause, a pandemic, or, upon infection, are highly likely to cause mortality or serious morbidity if not properly controlled. This subsection does not apply to influenza." To be clear, the update has nothing to do with Ebola or the current outbreak. Ebola is not a respiratory disease (the most prominent signs are diarrhea and vomiting) and the original 2003 executive order already listed Ebola. The White House press office told PunditFact that the change was aimed at Middle East Respiratory Syndrome (MERS), an illness with symptoms that do match the updated executive order. More critically for our examination, the updated order does not "mandate" the apprehension and detention of people who show signs of respiratory illness. Wendy Parmet, a law professor at Northeastern University School of Law, is one of three legal scholars who prepared a report for the American Civil Liberties Union that warned about overreach by the government in responding to pandemics. While Parmet said the new text is very broad, it has clear limits. "It only applies to those with symptoms of a disease that have caused or have the potential to cause a pandemic, or have the potential of causing mortality or serious morbidity," Parmet said. "I wouldn’t think the typical cold would apply." In fact, the order specifically excludes the flu. What happens if you do have Ebola, or MERS, or one of the other afflictions specified in the executive order? Title 42 United States Code Section 264 gives the Department of Health and Human Services the authority to isolate an infected person. The department must determine that a person presents a risk to public health. Its authority is limited to people as they enter the country or attempt to travel from one one state to another. In other scenarios, the power to isolate or quarantine individuals rests with the states, Parmet said. Infowars.com said Obama’s latest executive order "mandates the apprehension and detention of Americans who merely show signs of ‘respiratory illness.’"
That’s a fundamental misreading of the executive order Obama signed and the power the federal government has. The updates Obama made to a 2003 executive order do not mandate the apprehension and detention of people who show signs of "respiratory illness," has nothing to do with the current Ebola crisis and only affect people entering the country or crossing state lines. Published: Wednesday, August 6th, 2014 at 3:29 p.m.